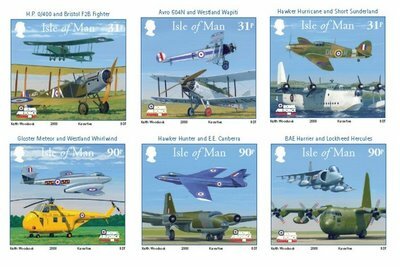 The Post Office of the Isle of Man has issued a series of stamps and envelopes celebrating the 90th Anniversary of the Royal Air Force in 2008. The artwork for this stamp issue has been produced by world renowned aviation artist Keith Woodcock. Sadly, no Spitfire is included :), but it’s an excellent series. More information and the opportunity to purchase thes eitems if offered at the Isle of Man Government’s site.